Sorry for the delay, I already ripped all of the sprites of the NPC Maria (because they're stored raw in one of the stage CHR files), which contains pretty much all graphics of the playable Maria except the dragon-summoning animation. Also some images are very slightly different (like having an extra pixel on the hands or elbow) and there's even a few unused ones. I guess NPC Maria uses an older set of graphics, it's kind of a beta version. So it's taking longer than expected because I was figuring out the sprite decompression code in order to extract the playable Maria sprites directly from the compressed CHR files. I'll finish a decompression tool today and will resume the ripping process (and hopefully find more unused stuff). It's alright. Certainly seems like there was more to find than expected, least you'r finding it. Hope we'll have it all soon, so I appreciate the hard work. OK, here it is, at last. A full sprite rip of Saturn's Maria. I didn't want to have duplicated images so they're sort of organized by animation but I skip any that would repeat itself. Unused frames are included and placed either where they seem to fit better or in the order that they're stored in the CHR file. Alright, and thanks. I would've sorta organized the sheet a little but differently but I can still tell where the animations start and begin at least. And I see that they did indeed intend for her to have item crashes but might've had second thoughts given how powerful she is in general with her magic, item crashes would've been even more ridiculous. This is very much appreciated. The problem is that she has way too many actions. 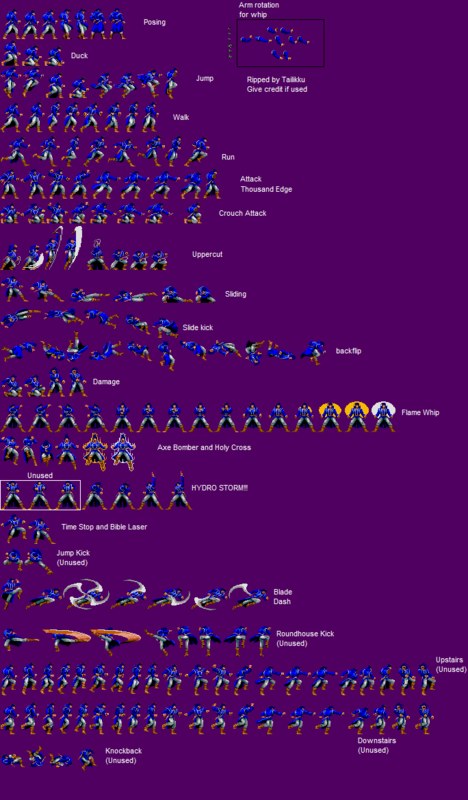 Even if I try not to repeat the sprites, it's still 352 images. I have centered them however so it's easier to use them in a game for example. At least you won't be concerned with that problem. Right. They certainly went through a LOT of trouble with this rendition of Maria. Makes the PSP one feel a bit skimpy by comparison. Ah, forgot to say that I made a tool to decompress the graphics from those CHR files. Huh, someone should submit those unused sprites to The Cutting Room Floor. Those files only contain the raw graphics data. You still need to set the proper width, height and the palette. Notice also that the image uses 4BPP color mode (4 bits per pixel, in other words each pixel occupies half a byte, so each byte in the file corresponds to two pixels in the image). Each 4 bit value can only go from 0 to 15 so instead of containing a color, each pixel uses an index to one of 16 entries of a color palette (also known as CLUT, color look-up table). Take note of the offset to the color table. 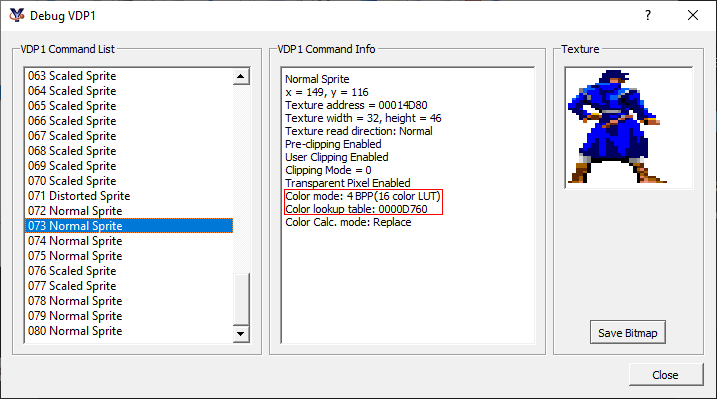 Then you close that, go to Debug -> Memory Editor, select the "VDP1 Ram" tab and press "Save tab". Now you open one of those images in TiledGGD. Most of the default settings are already good for this game. Go to File -> Open graphics and select one of the decompressed image files (or just drag and drop the file onto the the application's main area). 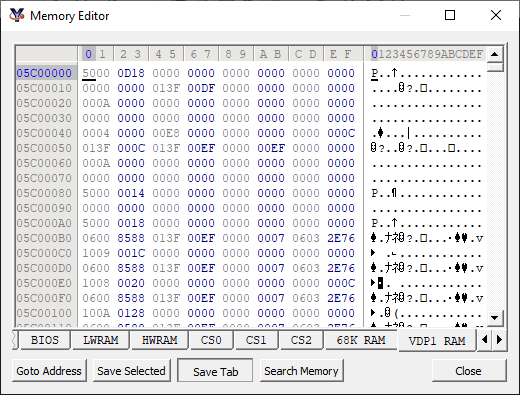 Go to File -> Open Palette and select the VDP1 RAM dump that you saved earlier (or just drag and drop the file onto the application's bottom right area). Then you have to select the proper offset to the palette in the VDP RAM dump. Now perhaps you should look up a tutorial on how to use TiledGGD. Basically you use the arrow keys to adjust the dimensions of the displayed image (the amount changed is set by the "width skip size" and "height skip size" options). Page Up and Page Down scroll through the file (not necessary for Maria and Richter's files but required for some of Alucard's). The amount that you move is set by the "Skip size" setting. 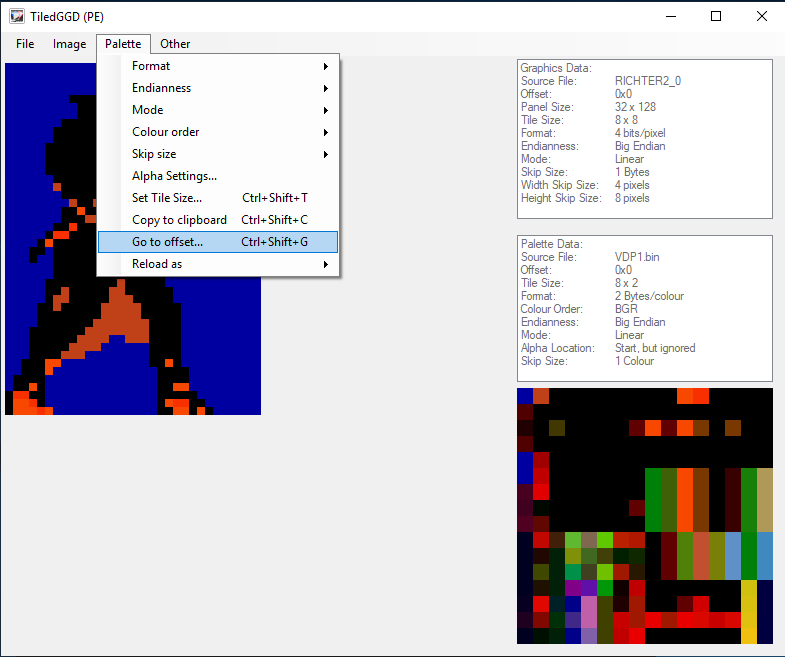 You should also set the Palette skip size to 16 colors if you want to check out other images or other palettes since most of the graphics in the game use 4BPP mode. Home and End scroll through the palette file. As you can see it was in this game that they decided Richter would have a jump kick, though they didn't actually implement it. 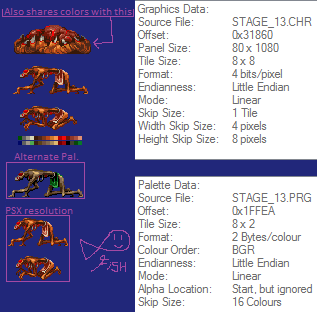 The palettes for sprites can be found approximately halfway in the .PRG files. Found this strange "Creature" in the Saturn version of SOTN today. 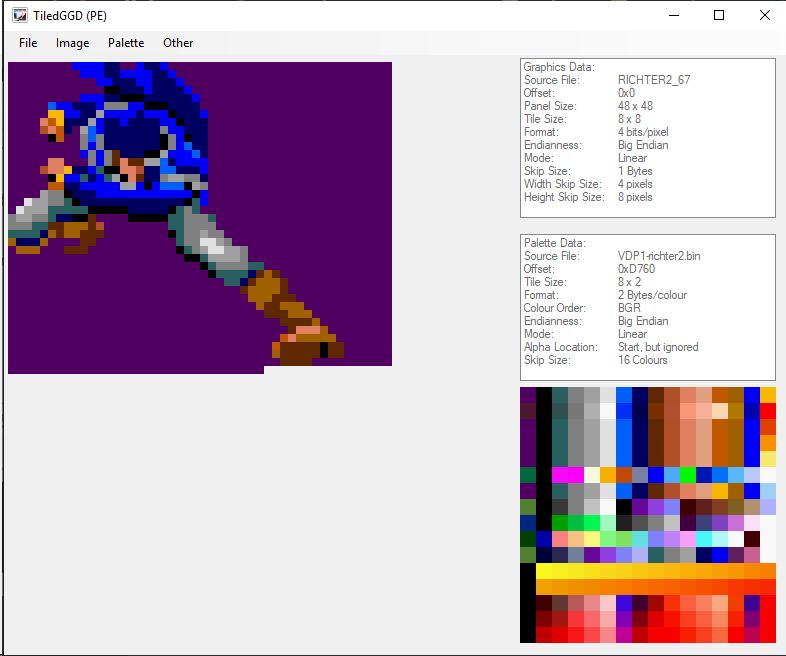 Did that jump kick have a variant for Richter's original costume in Richter's Saturn SotN sprite file? It's extremely similar to a jump kick motion which is included in Portrait of Ruin Richter sprite file though not fully implemented (buggy and has some questionable hitbox detection when forcing the game to do so by changing animation parameter in DSVania Editor) so I'm curious about its origin. Also did that jump kick have a straight down variant in Saturn SotN? No visible remain of straight down variant exist in PoR though. I think the "alternate" palette is the correct one.